34 D I V E R S I T Y W O M A N Fa l l 2 0 1 8 d i v e r s i t y w o m a n . c o m How should I respond if a colleague makes a sexually suggestive comment? "If a male colleague was to make a sexually sugges- tive comment to a female—or even to a male—I would counsel them to say, 'Listen, that comment makes me feel uncomfortable and it doesn't have a place here; don't say something like that to me again,'" says Samir Gupte of Pope Consulting, a management consulting firm with expertise in diversity and inclusion. After speaking directly to your coworker, you may also want to notify a supervisor or human resources. "Calmly inform a supervisor what happened and that you asked the person politely to stop," suggests Matthew S. McNicholas, a partner with McNicholas & McNicholas LLP, a Los Angeles law firm covering employment law. "is does two things: seeks to immediately stop the conduct and loops in the em- ployer early on to prevent things from getting worse." "It can be especially difficult for younger women and more junior employees, but you have a right to a harassment-free workplace," Gupte says. "Companies value you and want you to be your best, and if there are things standing in the way of that, you have to stand up for yourself. With the visibility of MeToo now, demand the workplace you want. Find an ally, whether it's your boss, human resources, or general counsel." What should I do if a colleague touches me inappropriately? 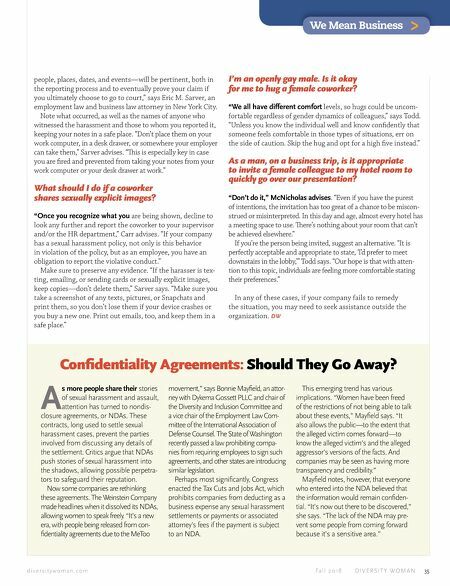 "You may want to first bring it to your coworker's attention and talk about it, because it might have been done inadvertently," suggests Kimberly Anne Capadona, a partner at Archer & Greiner in Hackensack, New Jersey, with expertise in labor and employment law. "We heard about a situation through a client where a female supervisor touched another female on the behind at a party. e woman who was touched was so conflicted. She said, 'We're friends. I didn't think she would do anything like that.' When it was brought to the supervisor's attention, she had no idea. She was mortified and apologized up and down. If you have that type of relationship with the colleague and you're okay with mentioning it to them, you should do it." We Mean Business > If you do need to report it and your company has a sexual harassment policy, refer to the reporting guidelines. "If there is no policy, there are HR directors and C-suite execs, so this could be brought to their attention and they should promptly look into the allegations," Capadona says. "You shouldn't go to work feeling violated." "If the organization does not take action or does not take the claim seriously, or to supplement support to someone, there are also external resources such as support centers for victims of harassment and assault, the police, and the EEOC," adds Tina Todd, cofounder of simplyHR, a consulting firm in Fort Collins, Colorado and co-creator of the sexual harassment training comic book Define the Line. What should I do if a colleague makes unwelcome requests for a date? "Politely decline the invitations, but if the colleague persists, you may need to escalate the situation to ensure it stops," ad- vises Lori Carr, a partner at Estes, orne & Carr, a woman- owned law firm in Dallas. "Repeated unwelcome requests for a date are a form of sexually harassing behavior." Provide a detailed description of any sexual harassment in writing, such as via email, to your supervisor, manager, or human resources. Also, keep a private journal to document any ongoing harassment. "As with any other form of workplace discrimination, the facts of what happened—including Me Too Activist Tarana Burke, a sexual violence survivor, founded the MeToo movement more than a decade ago to support young women of color who were survivors of sexual violence. In 2017, a tweet from actor Alyssa Milano, in which she urged women who had been sexually harassed or assaulted to reply and write "me too," prompt- ed 1.7 million responses, helping to energize and expand the movement.